Sir Richard Branson has unveiled the rocket plane he will use to take fare-paying passengers into space. SpaceShipTwo was presented to the world in Mojave, California. The vehicle will undergo testing over the next 18 months before being allowed to take ticketed individuals on short-hop trips just above the atmosphere. Billionaire Sir Richard, who heads the Virgin Group, intends to run the first flights out of New Mexico before extending operations around the globe. Built from lightweight carbon composite materials and powered by a hybrid rocket motor, SS2 is based on the X-Prize-winning SpaceShipOne concept - a rocket plane that is lifted initially by a carrier vehicle before blasting skywards. Speaking at the official unveiling event, Sir Richard said he had been dreaming of going into space since watching the moon landings. "I know there are literally thousands of people who would love to go to space, to be able to look out the window, to marvel at the beautiful Earth," the AFP news agency quoted him as saying. "Through Virgin Galactic we will make it possible." SS1 became the world's first private spaceship with a series of high-altitude flights in 2004. Its successor, however, is twice as large, measuring 18m (60ft) in length. And whereas SpaceShipOne only had a single pilot (and the ballast equivalent of two passengers), SS2 will have a crew of two and room for six passengers. About 300 individuals are reported to have signed up for a flight. They are all willing to pay about $200,000 (£121,000) for the privilege of experiencing six minutes of weightlessness during what will be a two-hour end-to-end flight. "It's incredible to think only 450 people have ever been into space; that's including all the Russians, all the Chinese and all the Americans put together," Sir Richard told BBC News. "We should be able to enable with our new commercial spaceship company, Virgin Galactic, to take maybe 1,000 people and make them into 'astronauts' in the 12 months once we start." Many of those future astronauts attended the VIP unveiling at the Mojave Air and Spaceport. Among them was the British singer and dancer Sarah Brightman, who famously had a disco hit early in her career called I Lost My Heart to a Starship Trooper. California Governor Arnold Schwarzenegger and New Mexico Governor Bill Richardson christened the spaceliner Virgin SpaceShip (VSS) Enterprise. The New Mexico authorities are investing almost $200m (£121m) in a purpose-built facility in Upham. 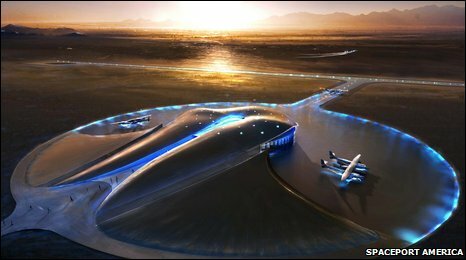 It will have a 3,000m (10,000ft) runway and a suitably space-age terminal and hangar building designed by Foster and Partners. Sir Richard's Virgin Galactic enterprise will have competitors but he is almost certain to be the first to market, barring any problems arising in the test campaign. SpaceShipTwo's carrier plane is called WhiteKnightTwo (WK2). It was finished last year and has already begun its own trials.